Is Drinking Lemon Juice Safe for Pregnant Women? Although drinking lemon juice while you're pregnant is usually safe, you should consider several factors before doing so. It is true that lemon juice contains several vitamins and minerals, but it may trigger unpleasant physical reactions. If you have specific concerns about drinking lemon juice, contact your obstetrician for advice. One cup of raw lemon juice contains about 54 calories, 0.6 g of total fat, 0.7 g of dietary fiber, 0.9 g of protein, 16 g of carbohydrates and 6.2 g of sugars. It is a good source of vitamin C, potassium and folate. It also provides small amounts of numerous other vitamins and minerals, including vitamin A, calcium, vitamin C, vitamin A, folate, calcium, iron, zinc, magnesium, phosphorus, thiamin, potassium, riboflavin, pantothenic acid, niacin, vitamin B-6 and vitamin E. Although lemon juice is a healthy beverage, drinking too much may cause you to consume less of other foods. Because of this, it is best to drink it in moderation. Lemon juice, or any other juice made with citrus fruit, may trigger heartburn in pregnant women. This is especially true in the latter part of pregnancy, when heartburn is more common. You may also experience stomach cramps, indigestion or diarrhea if you drink excessive amounts of lemon juice. If any of these reactions occur, stop drinking lemon juice. Call your doctor if any of these effects are particularly bothersome or persistent. Whether you are pregnant or not, the citric acid in lemon juice may cause a loss of gloss or alteration in your tooth enamel. Drinking the beverage with a straw or mixing it with water may lessen these effects. Since pregnancy can increase the risk of gingivitis, doctors recommend vitamin C to help reduce the likelihood of this condition. Lemon juice will help you increase your vitamin C intake. 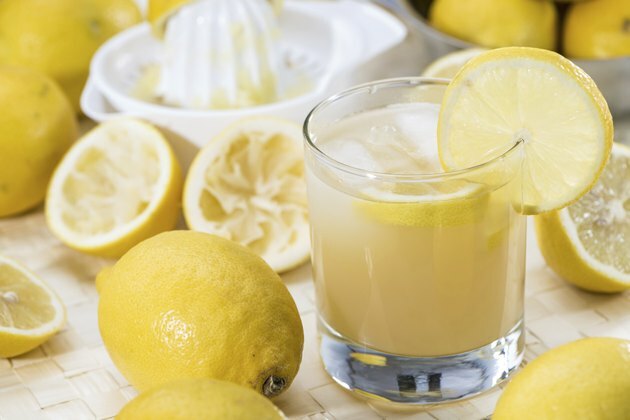 Call your dentist if you have concerns about the way lemon juice is affecting your teeth. Drinking unpasteurized lemon juice may increase your risk of getting a food-borne illness, such as salmonella or E.coli. Since your immune system is weakened during pregnancy, these risks are greater than they would be when you are not pregnant. A food-borne illness may harm your unborn baby, and could even be life-threatening. If you see the lemons being washed and squeezed in front of you or if you wash and squeeze the lemons yourself, drinking raw lemon juice can be safe. Otherwise, stick to drinking lemon juice that is pasteurized in a can or bottle instead.